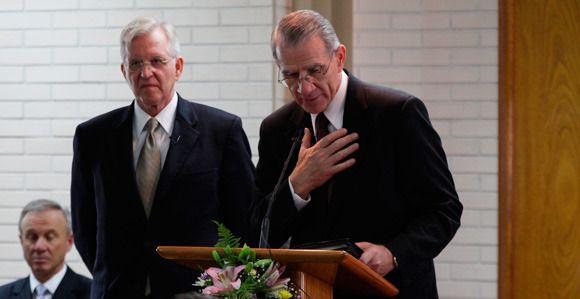 Early in November, Elder D. Todd Christofferson of the Quorum of the Twelve Apostles and Elder Jay E. Jensen of the Presidency of the Seventy met with members, missionaries, and local officials in Resistencia, Argentina. On November 5, accompanied by his wife, Katherine, Elder Christofferson addressed nearly 200 missionaries of the Resistencia Argentina Mission, where he himself served nearly five decades ago. Elder Christofferson invited the missionaries to focus on the people, helping them to receive the saving ordinances of the gospel.